Making pesto with the remainder of the summer’s basil has become a tradition in our household. I love pesto because of its versatility–not only is it great with pasta, but it makes a tasty topping for pizza and can even be used as a sandwich spread. Freezing pesto is the perfect way to enjoy a little bit of summer for at least a few months into fall and it’s a good timesaver when you need a quick dinner. My basil was determined to start flowering, no matter how many times I clipped the buds off of it, so I decided last weekend it was time to make our annual ginormous batch of pesto. In the past, I’ve frozen it in bags, Tupperware, and ice cube trays. The ice cube trays worked well, but they didn’t really match the serving size we’d typically use. This year I did something different and used mini muffin tins. 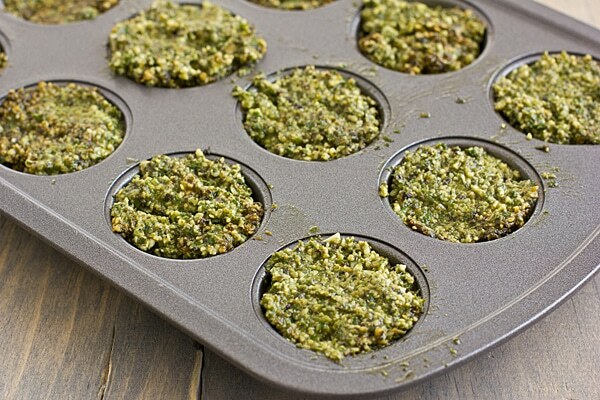 I’ve used regular sized muffin tins for freezing sauces and broth and the mini muffin tins hold just the right amount of pesto for one or two people (depending on what you’re using it for, of course!). 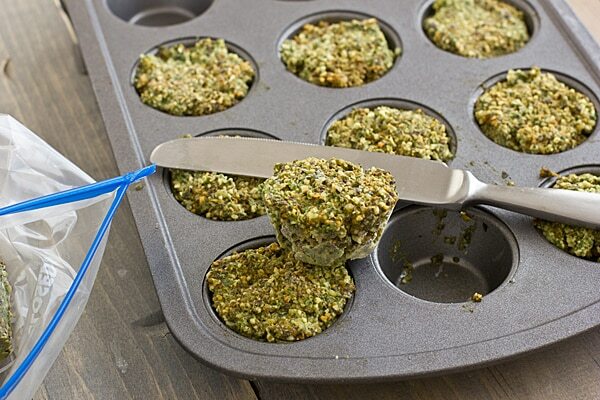 Start by putting your pesto into the mini muffin tins. Because the pesto has olive oil in it, there’s no need to grease the them. Just freeze overnight, until the pesto is completely solid. Pop the cubes out of the muffin tins with a butterknife. Store in a freezer bag for up to six months. 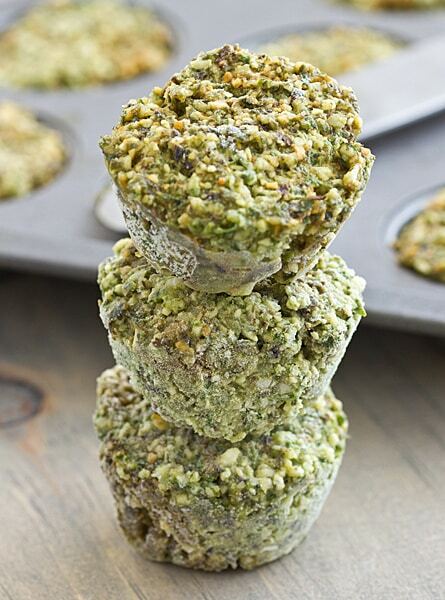 Stir frozen pesto cubes into hot pasta or toss with roasted potatoes; allow to thaw or heat in a microwave if you want to use them on a pizza or sandwich. Another way I love to use these cubes is in minestrone soup–just toss one in before serving. Not only does it give the soup a fresh, vibrant flavor, but it cools it down too so you can eat a little sooner. Want some more ideas? Here’s a few! What a great idea. I make loads of pesto in the summer and miss it dearly all winter. I am definitely trying this. Do you freeze it with the cheese and all, or stir that in after defrosting? If you have a moment to email me, I'd so appreciate it: rivkilocker at gmail dot com. This is such a great idea and never would have occurred to me. My husband likes pesto way more than I do. I can handle pesto only ever other month or so but love basil in omelets and pasta and other dishes. Totally stealing this idea. I was debating ways to freeze it, but this looks perfect! 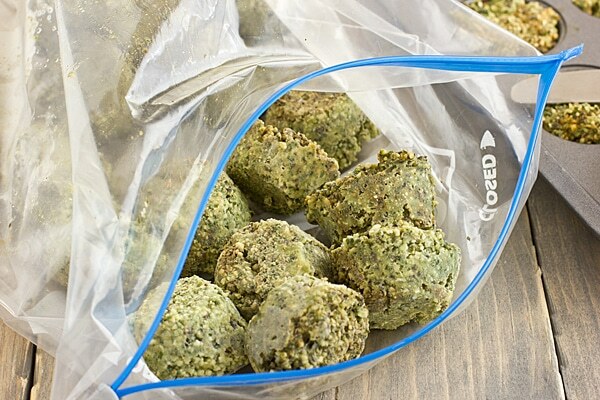 I’m going to freeze my pesto this way from now on! It’s so much easier than freezing it in a big container! I used to do that & it would always get frost burn. This is the best pesto recipe I’ve ever made/tasted. In a food processor or blender, combine the olive oil, basil, garlic, red pepper flakes, salt, Parmigiano-Reggiano and walnuts. Process until the mixture is well blended. P.S. Looks like your move to WP went well! Congrats!! Awesome! I normally just freeze it in little ziplocks, but I like this better! What a great idea! 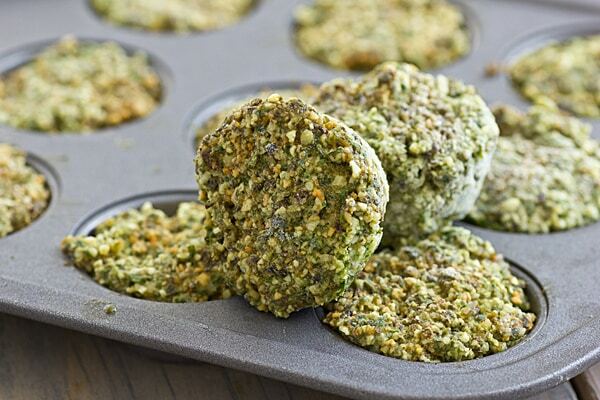 We call them pesto-pucks in our house because we use regular sized muffin tins, and they come out looking like green hockey pucks.